"What a great way to use that spring-fresh asparagus!" Break off and discard tough asparagus bottoms. Break off tips; set aside. Coarsely chop stalks. Cook in skillet over medium heat with onion in butter, salting lightly, for 8 to 10 minutes. When onions are clear, sprinkle with flour. Continue to stir over lowest possible heat 5 to 8 minutes. Slowly add water or stock, stirring constantly. Cook 8 to 10 minutes, stirring frequently, until thickened. Cool slightly. In blender, puree sauce bit-by-bit with milk until thoroughly smooth. Return puree to 3-quart pan, preferably a double boiler. Add dill, 1 teaspoon salt, pepper, and tamari. Heat gently but don't boil. As soup heats, cook asparagus tips in boiling water until tender, but still very green, about 2 minutes; drain. Add whole pieces to soup. 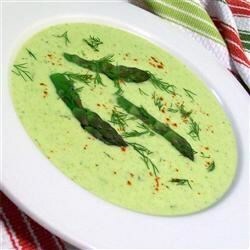 When asparagus is in season, the first thing I do is make this soup. My husband won't eat asparagus any other way. We like it so well that I've passed it along to others several times.